off U.S. 27 on S.R. 630-A at Keene Park Road, refer to the map below for directions. Crooked Lake can be found on the Babson Park USGS quad topo map. Crooked Lake is a lake in Polk County in the state of Florida. The latitude and longitude coordinates for this lake are 27.8170, -81.5831 and the altitude is 118 feet (36 meters). Anyone interested in fishing Crooked Lake should consult with local guides and resources before heading out to fish. Casting a lure into the water, then reel in the biggest trophy largemouth bass you’ve ever seen, this is what Crooked lake offers. The perimeters of vegetation and brush around our lakes make excellent cover and habitat for largemouth bass. Anglers from near and far catch so many trophy bass in Florida that we’ve earned the title "Bass Capital of the World" and it's lakes like this one that helps us do that. With more than 550 freshwater lakes and numerous rivers and flooded phosphate pits, you’ll catch other varieties of sweet-tasting freshwater fish as well. Bluegill (bream), crappie (speckled perch), and catfish are also found in these waters. Lake Caloosa or Crooked Lake as it is now known, is tucked away in Central Florida and is over 7,000 acres. It is listed on the top 10 most outstanding Florida Freshwater lakes, due to water quality and it's natural beauty. 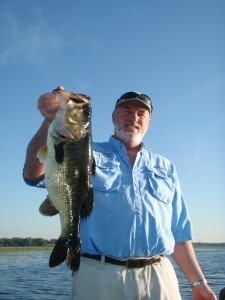 Caloosa has produced several bass over 16 lbs. There has been known to date, of 10 bass over 10 lbs kind of days. Crooked Lake has a 60 foot deep spring as well as 6 other springs. There are also large areas of the lake that contain water 30 feet deep, perfect habitat for monster bass. A location to visit with a experienced full time guide to have true success. If you would like to book a fishing trip or get an up to date on the lake fishing conditions, simply send me an e-mail and we will do our very best to get back to you as soon as possible.